With sectionals beginning tonight I think it would be convenient to make this a one stop for results and list qualifiers accordingly. It’ll be like a mobile enabled state meet program. After the conclusion of the sectionals we can perhaps run a few mock meets. Be sure to check out the WIAA and WISAA state meet archives, the all-time fastest 5ks list and the Ridges All-Time lists which are always fun to go through at this time of year. Visual guessing only. I was there but haven’t seen results. DeForest (girls): Madison Memorial and either Waunakee or Stoughton. I believe La Crosse Central’s boys qualified as a team for the first time in 15 (?) years. It really is a shame that teams like Oconomowoc, LaFollette, and Craig put up those kind of times in Beloit and have to sit out the state meet. Congrats to Sun Prairie and Monona Grove for coming out of that battle with a qualifying spot. Has there ever been a sectional where a runner had to break 16 minutes to qualify as an individual? C R A Z Y! @riplips was finn challenged in this race? or were the times closer than the race? Farrell and Jacques stayed with him thru 1/1.5 miles then in normal Finn style he hammered for a good portion of middle of the race to seperate. There was no real reason for either of those 2 to go with Finn, they raced side by side until 800 and Oconomowoc had a little better finishing kick. It is amazing how fast everyone runs when there is that depth of competition. I watch numerous runners in that 8th thru 20th range look as though their legs were going to completely shut down if they had to go another 50 yards, some may have struggled to make it across the line. I havent seen that at any race in the last 4 years. Those 5 collective teams gave absolutely everything they had in the tank. There probably never was a sectional at that level, may never be again! On the girls side, it was really unfortunate that the referee’s didnt restart the race. The #2, 3, 4 runners for the craig girls and almost another whole team fell just after the start line. No gun, no restart. No idea if it would have made a difference, but couldnt have helped! The rules changed around 2005. It used to be if you were an individual who placed in the top 7 at your sectional, you went. The catch was if athletes on qualifying teams were the entire top 7, no individuals went. That said I cant think of any super sectionals as fast as Beloit. Those were some huge times. Probably the most loaded sectional ever especially the way everyone ran. The only thing I think that would compare would maybe be 78-79-80 sectionals Menomonee Falls North would have been in where it would have taken about 15:50c to make it through. Although they didnt break 16 minutes 2008 Madison West you had to be a really great runner to get through. 15:50s at the Ridges kind of shape or a future 9:00 3200 runner. Some of the dry Lake Breeze sectionals are worth noting too when Wardall was a senior and Penz/Schubert were juniors. 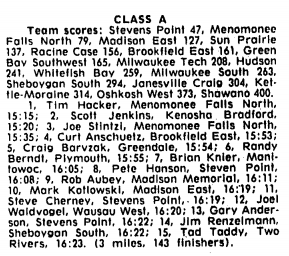 The Google Newspaper archive for Milwaukee newspapers apparently stopped in August and I am kicking myself for not getting a snapshot of the 1980 sectionals results which would have been held on Saturday, October 25th and appeared in the Sunday, October 26th and Monday, October 27th Journal/Sentinel newspaper editions. This was the Braveland Conference alignment in the early 1980s. We have a couple posters that either ran in, coached in or were spectators in 1980. The race above was actually 3.1 miles despite the scoreboard listing it at 3 miles. The media hadn’t quite adapted to the subtle change from 3 miles to 5000 meters yet. But this would have been it – Hacker, Jenkins, Stintzi and Anschuetz all in the same conference and a very good chance they were in the same sectional. In fact, those first 5 could have realistically been in the same sectional. Had the private schools been involved, then Catholic conglomerate, St. Thomas More in Milwaukee, may have also been D1 and in that sectional so you’d have added Dave Kaluzny who was a 4:15/9:15 type. Rick Barringer was a 4:14 guy at Arrowhead around this time too but he might have graduated the previous spring. The Google Newspaper archives are back online. Merry Christmas early! This is fantastic news.